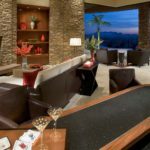 The 7,500 square foot house sits on a knoll in North Scottsdale, its elevation marked by two arcing stone-clad walls that seem to reach out to the desert. The home’s sculptural form is capped by a curving roof that floats on glass walls, creating the effect of a welcoming pavilion. 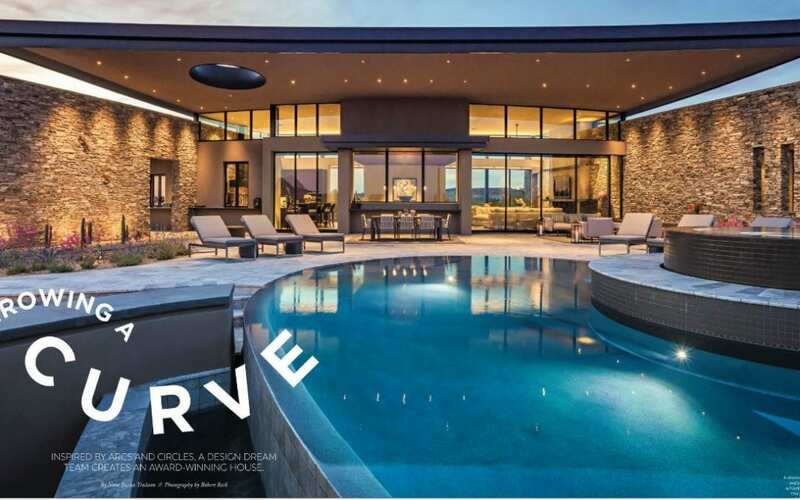 The residence, which crowns 5 acres, has won two major design awards, one from the Arizona Masonry Guild and a first place for its interior from the ASID Arizona North Chapter. It took astute owners a dedicated team of design professionals and many months of detailed planning to create this Zen-like winter getaway. 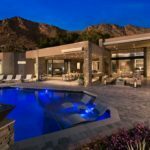 The homeowners, a Seattle couple, wanted a house with a desert view that could accommodate the art and artifacts they collect during their frequent international travels, as well as lengthy visits form family and friends from around the globe. 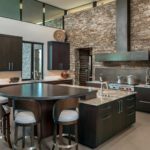 The couple put together a team that included architect Erik Peterson, builder Anthony Salicio, interior designer Janet Brooks and landscape designer Jeff Berghoff.